Video Highlights: Mapua dominates CSB 78-68 (NCAA Season 92 - June 28, 2016) - Balita Boss! 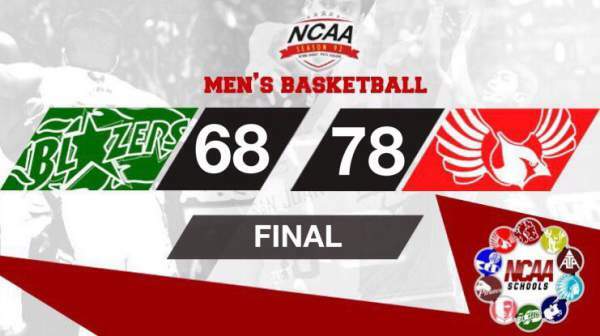 The Mapua Institute of Technology Cardinals dominated College of Saint Benilde (CSB) Blazers 78-68 in the NCAA 92 Senior Men’s Basketball Tournament. Reigning MVP Allwell Oraeme posted another double-double with 17 points, 21 rebounds and blocked two shots. CJ Isit added 15 points and seven rebounds, while Andoy Estrella registered 12 points for the Cardinals. Carlo Young scored 20 points in the losing effort for the Blazers. Christian Fajarito added 12 markers. MAPUA 78 - Oraeme 17, Isit 15, Estrella 12, Orguina 7, Serrano 6, Meninan 5, Raflores 4, Victoria 4, Biteng 3, Bunag 3, Magboo 2, dela Rosa 0, Eriobu 0. CSB 68 - Young 20, Fajarito 12, Domingo 10, Saavedra 8, Sta. Maria 7, Haruna 5, Leutcheu 3, Dixon 2, Castor 1, Pasamante 0, San Juan 0.